Earlier this week, Activision announced the first bit of downloadable content post Guitar Hero 5's release, and it got me wondering: Can I use that content in Guitar Hero World Tour? The short answer is: nope. "Guitar Hero 5 downlodable content will be compatible with future Guitar Hero and Band Hero games," a rep told us, "however the advancements and innovations made to the franchise do not allow for downloadable content to be backwards compatible with Guitar Hero World Tour." The advancements they're talking about include band moments, Expert+ drumming, and the new vocal star power. It should be noted again that DLC you've previously purchased is compatible, and it will be possible to "export" songs from Guitar Hero World Tour and Smash Hits to play in Guitar Hero 5. 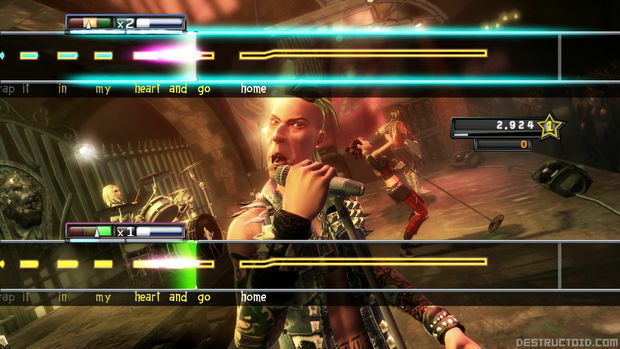 Those songs, however, require you to download tracks with the updated Guitar Hero 5 features. So there you go -- if you figured you'd be able to stick with your previous games and extend your experience via DLC, that's the bad news. The good news is that Guitar Hero 5 actually looks pretty good; it hits stores on September 1.